Beyond Beginners have all the fun! For graduates of the Weekly Beginner Class Series who are ready to take it to the next level. Now we’re rolling! Enjoy learning & playing popular songs from the ’50’s through the ’70’s. Almost everyone knows them. In this Level 2 class, Jeff includes new, Beyond Beginner challenges. 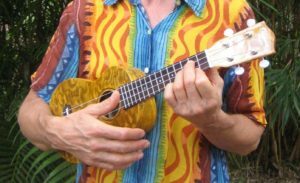 Jeff Hanna, co-owner of The Rhythm Inlet, & steward of the ukuleles at The Ukulele Place, combines his masterful teaching style, a background in singing & performing in small a-cappella groups, & a love of strumming a tune on the ukulele, to inspire & stretch his ongoing uke students. It’s best for students to have their own ukulele to enjoy this class. We have 200+ ukes on the wall available for your in-class use & purchase, or you’re welcome to bring your own uke. Cost is $60 a month, & is a 2 month series. Includes a monthly membership at The Rhythm Inlet & The Ukulele Place. FMI & to register, please call (941) 966-5800.